In September of 2010, a new genetically modified animal hybrid sparked mass concern as well as nationwide controversy. The possibility of having genetically modified salmon for dinner did not sit well with many independent scientists, consumer groups, environmental organizations, and especially the healthy consumer. 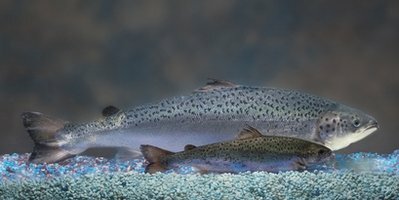 Although the genetically modified salmon, commonly referred to as “frankenfish”, has not yet been approved for consumption, it seems that certain US organizations are determined to place the fish on your plate. One can only wonder why an organization like the USDA would fund research to help the frankenfish’s approval while one part of the legislative branch of government shoots it down. The question is, what could possibly cause the USDA to fund Aquabounty while there is so much controversy surrounding the salmon on a government level? Why would the USDA, an organization which stamps organic products with their seal to indicate no use of genetic modification, give money to a company to research and ultimately sell genetically modified salmon? The answers are unclear, but the actions exhibited by the USDA could very well reflect the personal goals of the members. Perhaps USDA members could have vested interest in the approval of genetically modified fish.